Sto AG is the leading manufacturer and distributor of products for heat insulation, constructing and products for the renovation of building facades. The company was founded in the year 1955 by Wilhelm Stotmeister and was the inventor of organic bonded render. The equity of the company is divided into 4.320.000 bearer shares and 2.538.000 preferred stocks. The founding family is still in charge of the company and holds all of the non-public traded voting equity. As an investor you can only invest into the preferred stocks of the company. The company divides itself in to three different segments, the first and biggest segment is face-systems. Under the roof of face-systems we can find the core business Wärmedämm-Verbundsysteme (WDVS) (in WDVS Sto is, up to its annual report, the leading producer) and vorgehängte Fassadensysteme (VHF) which represent 49.6% of the total revenue of the company. The second segment is surface coating which represents 24.5% of the revenue and in which the businesses around rendering and painting/coating are grouped. The last big segment is indoor products, render and colors for indoor usage, which represents 13.2% of sales. In addition Sto manufactures and distributes ground and floor lamination which represents 12.7% of total revenue. 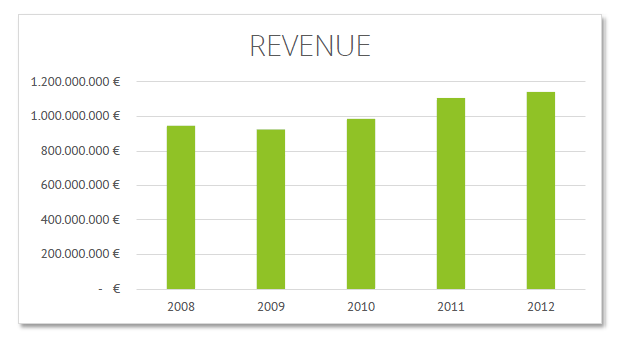 Sto was able to grow its revenues by 17.1% since 2008 and nearly doubled it since 2003 where the revenue was round about 650 Mio and, despite some headwinds from input costs, its earnings by 21% since 2008 and its revenue increased nearly tenfold from 2003 when it was around 6.6 Million Euro. With many construction markets in the doldrums, this is an impressive performance. The first half year of 2013 the revenue was nearly in line with the guidance of 520.1 Mio. Euro. Germany represents still 44.1% of the total revenue of Sto which make it partly dependent of the German housing and construction market, and therefor of the German government. We can see this also in the Operating Leverage (% change sales / % change EAT) of Sto in the year 2010 to 2011 where it was 1.54 what a solid number is on its own. We can see that Sto AG is benefitting strongly from the trend towards renovating building facades with a view to saving energy and the new laws which implies new energy standards for houses. This is by far the most reliable and practical way to save fossil fuel – it does not require the wind to blow or the sun to shine. To get a good overview over the history and the products of Sto AG we highly recommend to you to read the annual report of the year 2004 where you can find this description on page 6 and the following. http://www.sto.de/media/documents/investor_relations/geschaefts__zwischenberichte/archiv_2/3816_DE-Investor_Relations_english-Annual_Report_2004.pdf In this document you can clearly see what we like at Sto; the company has a long history of innovations which are driving out the great understanding of the market and the needs of the craftsmen at the construction site. This is also the root of the company’s direct sales approach to the craftsman and construction companies. Furthermore the company has special courses of instruction where Sto educates the craftsmen in the use of their products. The clue behind this concept is that is on one side a marketing event where their raise attention for their other products and when the craftsmen successfully finish their workshops and use only Sto products by the construction get a warranty against defects in the construction from Sto. In Germany as an example a craftsman is enforced by law to give a ten year warranty against these defects in the construction. The isolation of a single family house easily costs more than 25.000 Euro and therefore it is favorable for the craftsmen to hand over this implicated risk away to Sto. Here we can see clear lock-in effects which make it favorable for the craftsmen to use only Sto products and use them over and over again. We think that this is a durable economic moat because we think that the normal craftsman just as every person does not like problems and normally sticks to his well-known product. A second point for the craftsman to use Sto products even when they are more expensive than comparable products is that the craftsman itself don’t pay for the product because the building owner pays for it and he normally relies on the judgment of the craftsman! The prices for the heat insulation normally accounts for less than 10% of the total building cost of a single family home, which is not so big and is good for Sto because homebuilders and normal people normally look first to cut their costs at the biggest cost blocks. These facts put Sto in the favorable position that it has an economic moat and can increase prices over inflation which we will later see. Demand for homes is normally driven by many macro-economic factors such as interest rates, the cost of materials, the employment situation, and the general health of the economy. When you look at Sto and their sales over the last 5 years you will see, that this doesn’t seems to count for Sto because Sto lost only 2% of their sales from the year 2008 to 2009 and come back to its path of grow in the year 2010 again. One fact which we don’t like is that the main material for heating insulation is Styrofoam which is not really sustainable and easily burnable, take a look at these links: http://www.spiegel.de/wissenschaft/technik/styropor-platten-in-fassaden-waermedaemmung-kann-hausbraende-verschlimmern-a-800017.html http://www.radiobremen.de/nordwestradio/sendungen/nordwestradio_journal/styropor-waermedaemmung100.html This is a risk what we, as investors who think like a business owner have to take into account! But how can we value such a company and how does the balance sheet look like? Therefore let’s look on the balance sheet over the last five years. 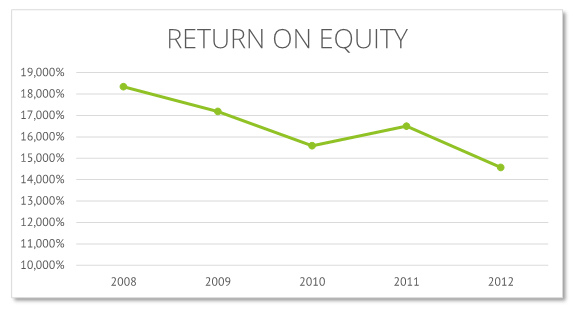 There we can see that that the equity ratio increase from 53.8% in the year of 2008 to 65.6% or 448.8 Mio. Euro in the year of 2012. 65.6% is at the first glance a rock solid equity ratio but it’s important to look behind this number to figure out what’s actually real equity and not just goodwill. You can find the balance sheet on page 62 of the annual report where it is stated that the company consists “only” of 44.3 Mio. Euro of intangible assets. In footnote 13 on page 102 we can now see that these 44.3 Mio. Euro consist out of 23.5 Mio. Euro software licenses and of 36.3 Mio. Euro of brand value which is well-defined on page 75 and 76 and therefore consists out of the value of affiliated companies. Expense for research and development is here not included because Sto book this expense directly as costs in its Income Statement. Back to the balance sheet we can see that the balance sheet consist to 2/3 of short term assets and these short term assets consist to more than ½ or roughly 215 Mio. Euro out of cash. 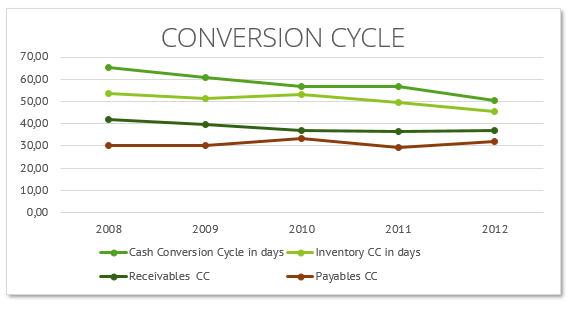 An interesting fact is that the amount of cash more than doubled over the last 5 years and we can assume that the company don’t need all this cash for its ongoing operations.A further interesting fact is that Sto has reduced its Cash Conversion Cycle (CCC) by nearly 15 Days over the last five years. In 2008 the CCC was 65 and decreased continually to 50 days in 2012. They received this reduction throughout a better Inventory management which decreased by roughly 7 days and a quicker collection of their receivables. Therefore the 65.6% of equity on the balance sheet are really impressive. The book value of Sto is roughly around 70 Euro per share, the Company actually trades around 139 Euro per preferred stock, therefore the P/B ratio is 2 (Keep this in mind for the following valuation of the company). One thing which you must keep in mind is that you cannot always get your hands on the cash of a company and this is exactly one problem with Sto and its shareholder structure. In the case of Sto you as a preferred shareholder haven’t got any chance to get your hand on this cash. 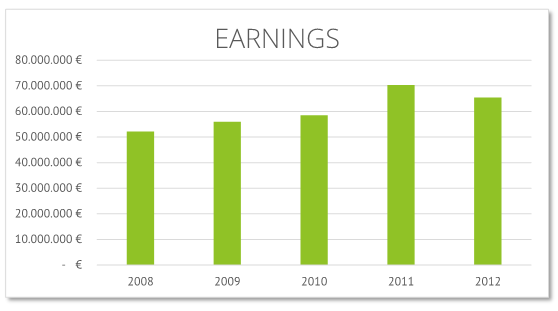 So, what does the company actually earn for its shareholders? 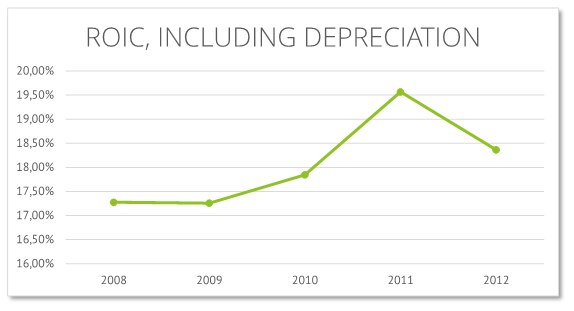 When we look at the numbers we can see that the earning where around 10.17 per preferred share in the year of 2012 which implies at the moment a P/E ratio of roundabout 13, but this is not the whole truth because we have so much cash on the balance sheet which the company not necessarily need for its ongoing operations. Sto itself has a really strong cash cycle because the construction sector normally stands still in the winter months and booms in the summer. You can see this cash cycle in the quarterly reports where we can see that the amount of cash fluctuates by round about 90 Mio. Euros a year (from peak in late September to the bottom of March, therefore we must adjust the P/E for not needed cash, we assume 5% or roughly 57 Mio. Euro of the total revenue is needed for the ongoing operations. 215-57= 158 Mio. Euro or 24.58 Euro per share (140-24.58=115.42). The cash adjusted P/E is therefore around 11, which looks rather cheap at the moment. 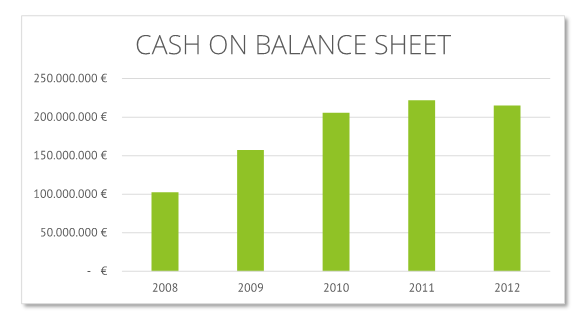 You can also see the effect of the growing amount of cash on the balance sheet at the return of equity (2012 14.57%), which is decreasing since 2008 (18.34%). So we can see that the return on equity is not the correct measurement for an investment in Sto from the company point of view, but it fits well for a preferred shareholder because of the point which we stated above. 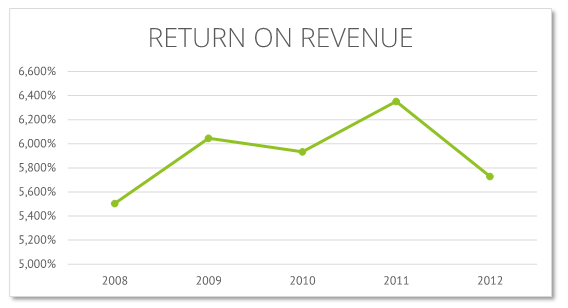 The return on revenue is for Sto more reliable and has increased a little bit since 2008 (5.5%) to todays 5.75%. We can see that our implications out of our Business model analysis is correct and Sto has some earning powers and they are able to increase the prices over their own cost increase. Because we like to think similarly to business owners we would like to evaluate what return we would get on our employed capital as owners. Therefore we now will look at, after our definition, real return of Sto. The Return on Invested Capital (ROIC). When you take the depreciation of the last 5 years into account you get a ROIC of little more than 18%,and when you don’t consider this depreciations you end up whit a ROIC of roundabout 28%. With depreciation of 5 years: You can clearly see that the ROIC of Sto is much higher than comparable companies. As an investor who thinks like a business owner, you can earn a ROIC over 9% and up to14% (ROIC/(P/B)) when you invest your Money today into Sto AG at the actual price of 139 € and P/B of 2. As an investor who seeks more than 12% return on his investment over a couple of years, this seems like a good deal for your money and we think that Sto can maintain the actual level of ROIC for a couple of years. But in the last years we have seen some recent change in the structure of the company. On the last general assembly the Stotmeister family has change the structure of the company towards a limited partnership with a limited liability company as general partner under the European law. Therefore the preferred stock investors lose a lot of their influence, which leads to a lawsuit from investors against the transformation of the Company to an SE & Co. KGaA. Here is a link to a German newspaper where you can read the whole story: http://www.suedkurier.de/region/hochrhein/stuehlingen/Das-steckt-hinter-neuer-Form;art372620.6114463 And this was not the first time the family likes to push out the other investors: http://www.welt.de/print-welt/article687606/Uebernahmeangebot-an-Sto-Aktionaere-droht-wegen-geringer-Resonanz-zu-scheitern.html We, as investors, don’t like such a behavior from the management because we think like business owners and would like to be treated like a partner as we did it with our customers. Therefore this leads to a clear discount in a further valuation. We can clearly see that we need more Time and space to evaluate Sto therefore we will write another post about the valuation, the moat and the SE&KGaA problem. To be contined… NH As of the publication date of this report, Frenzel-Herzing Value Investment GmbH (“F&H”), other research contributors, and others with whom we have shared our research (the “Authors”) may have long or short positions in and may own option interests on the stock of the Company covered herein (Sto AG) and stand to realize gains in the event that the price of the stock in- or decreases. Following publication, the Authors may transact in the securities of the Company. The Authors have obtained all information herein from sources they believe to be public, accurate and reliable. However, such information is presented “as is”, without warranty of any kind – whether express or implied. The Authors of this report make no representation, express or implied, as to the accuracy, timeliness, or completeness of any such information or with regard to the results obtained from its use. All expressions of opinion are subject to change without notice, and the Authors do not undertake to update this report or any information contained herein. Please read our full legal disclaimer on our website at frenzel-herzing.com. All contents provided herein are based, if not stated separately, on public available information or on internal developed data of Frenzel & Herzing Value Investment GmbH or its affiliated entities. Historical performance is no guarantee for or against future returns or losses. Frenzel & Herzing Value Investment GmbH takes no liability for the correctness or completeness of the contents and figures shown here. This fund presentation serves for information purposes exclusively and is not an offer for the purchase or sale of fund shares. The only legal basis for a subscription is the sales documents of this fund (the current sales prospectus, the current annual report). Subscription documents are available free of charge from the respective custodian, the mutual fund company or under www.frenzel-herzing.com. Every passing on or duplication of the documents provided here requires the explicit approval of Frenzel & Herzing Value Investment GmbH, Lindenfels. Changes reserved. thanks for recommending us, your wonderful blog and everything we learned from you. We will try to do our very best to get better in blogging and investing.